The above stated meeting starts at 7:00pm in the meeting room of the Town Hall. Please contact the Historical Committee for more information. The Conservation Commission will be meeting Tuesday, February 19 at 6:30pm at the Library. In honor of American veterans, past and present, the Colonel Paul Wentworth House will host Serving Their Country, a day-long living history tribute to American soldiers on Veterans Day, Sunday, November 11. Visit the historic Wentworth House in Rollinsford for a day of displays and living-history demonstrations illustrating the lives and stories of America’s citizen-soldiers from the colonial period through modern times. Historical reenactors with carefully researched and period-accurate uniforms and equipment will portray soldiers from the colonial and Revolutionary eras, the Civil War, the world wars, and the Vietnam War. In addition, to mark the centennial of the end of World War I, the presenters will march to the Martel-Roberge American Legion Hall on Foundry Street for an 11 am ceremony commemorating the exact hour and day of the armistice which ended that conflict in 1918. 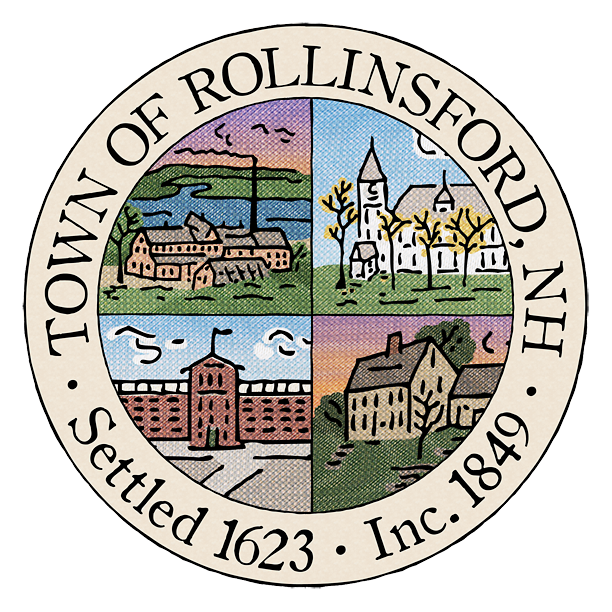 The event will run from 10 am to 4 pm at the Wentworth House on Water Street in Rollinsford. Admission is $5 for the general public; free for veterans and active duty personnel, children, and ARCH members. The circa 1701 Wentworth House is maintained by the Association for Rollinsford Culture and History (ARCH) as an educational and cultural center for the community. For more information about this and other events at the Wentworth House, consult the ARCH website at paulwentworthhouse.org. Hello from the Historical Committee! Our notecard fundraiser is now under way! Starting Tuesday, October 16, notecards will be available for purchase at the Town Hall during office hours. Each set is $10 and contains all 8 designs. 100% of the profits will go back into the Historical Committee’s fund to be used for restoration and preservation projects. Travel back in time to the American Revolution at the historic Colonel Paul Wentworth House in Rollinsford, NH. On Saturday and Sunday, October 20 and 21, the sights and sounds of the Revolutionary era will come to life at a colonial market fair with 18th century craftspeople and artisans at work, while the militia gathers to train in preparation for joining General Washington’s forces against the British. At this two-day living history encampment, artisans in period attire will demonstrate crafts such as joinery, coopering, printing, shoe making, and gun smithing. At the same time, the militia will perform musket firings and military drills, display and explain their equipment, and raise a Liberty Pole and flag.The event will also feature hearth cooking demonstrations, a display of antique tools, house tours, children’s games, and more. The event will run from 10 am to 4 pm on Saturday, and from 10 am to 3 pm on Sunday. Admission is $5 for the general public; free for children and ARCH members. The circa 1701 Wentworth House is located on Water Street in Rollinsford, and is maintained by the Association for Rollinsford Culture and History (ARCH) as an educational and cultural center. For more information, visit the ARCH website at www.paulwentworthhouse.org or on Facebook at The Colonel Paul Wentworth House. Visit Rollinsford’s historic Colonel Paul Wentworth House on Sunday, September 2 between 11 am and 4 pm for V for Victory: Americans in World War II, a one-day living history event commemorating V-J Day. On that date in 1945, representatives of Imperial Japan signed surrender documents marking the official end of World War II. Come find out how US participation in the global conflict affected American military personnel and civilians. On the grounds of the Wentworth House, historical reenactors in period uniforms will display the equipment, weapons, and routines of US soldiers. Inside the house, visitors will get a feel for life on the home front during the war through 1940s music and radio broadcasts, newsreel films and cartoons, artifacts such as ration cards and V-mail, and the magazines and newspapers that chronicled the war, including one from the day after Pearl Harbor. Tours of the house will also be offered throughout the day. Admission is $5 for adults; the event is free to children and ARCH members.